On the list of things I love most in this world, travel and running both have spots right at the top. That said, it should come as no surprise that destination races hold a very special place in my heart. Melding the excitement of race day with the sheer joy that exploring a new location always inspires is a recipe for success, regardless of whether I manage to eke out a personal best. I recently traveled to Curaçao for the KLM Curaçao Marathon weekend as a guest of the Curaçao Tourist Board, and while my half-marathon time was nowhere near my fastest, the weekend itself definitely ranked as one of my top “race-cation” experiences—and it’s one that I’d absolutely recommend (especially if you’re looking for a getaway with a few of your running pals) because there’s no shortage of fun things to do once your run is done. But you don’t have to take my word for it. 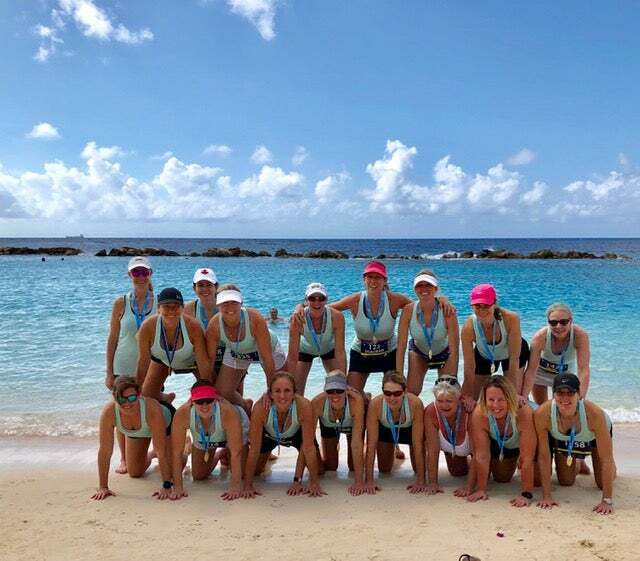 I happened to share my flight with 17 members of The Running Girlz, a group of Toronto-based girlfriends who make a habit of choosing tropical race destinations for winter getaways. They were more than happy to share their race (and vacation!) observations with me. The KLM Curaçao Marathon has a distance for everyone. 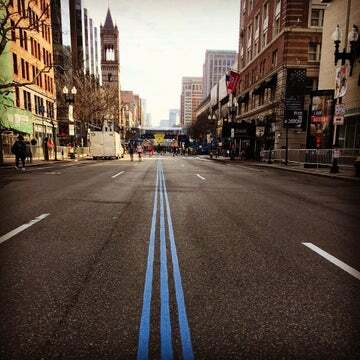 Photo provided by Kristen Seymour. There’s the KLM Marathon, the Amstel Bright Half Marathon, the Intertrust 10K, the Royal Netherlands Navy 9.7K Trail Run, and the Cavalier Logistics 5K, so if you’re coming with a group, it’s easy for people to choose the distance that’s best for them. 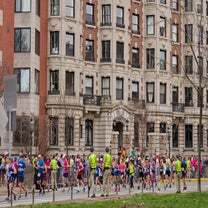 While all of the races take place on the same morning, the start times are staggered between 3:30 a.m. for the marathon and 7:30 a.m. for the 5K—meaning that, at least in theory, everyone can get started on the post-race party around the same time. I participated in the half marathon, and while the warm temperatures and humidity made the distance challenging, the course was interesting, as it included miles along the waterfront and through various neighborhoods of Willemstad. I even got to run over both the Queen Juliana Bridge (which is not otherwise accessible to pedestrians and provides an incredible view at its 185-foot peak) and the Queen Emma Bridge (known as “the swinging old lady,” it is stunning when you first run past it in the dark a little past the 5K mark and see it all lit up). I’d suggest tackling one of the longer distances (the full marathon is simply two loops of the half-marathon course) to anyone who’s able, as the payoff of seeing all those sights is well worth the extra work. Insider tip: If you have friends running different distances, it’s likely possible to plan to meet up at the shorter distance turnaround and run in together, because all of the courses overlap at the beginning and end. Someone in your group may need to sacrifice a little time while waiting, but if the point of your trip is more about socializing and support rather than trying to win, it’s a fun (and rather unique) option. It’s also possible to change your distance choice at packet pickup, so if race day rolls around and you’ve had to deal with an injury or simply realize you’re not exactly marathon-ready, you won’t have any trouble making a switch. Curaçao is global, but not intimidating. Photo of The Running Girlz provided by The Running Girlz. Standing in the corral before my race began, I was struck by the number of languages I heard spoken around me. Since Curaçao is a Dutch Caribbean island, Dutch was one of the main languages I heard, but being only 35 miles north of Venezuela, Spanish is also quite common. I also heard Papiamento, a Spanish Creole language spoken on Curaçao as well as neighboring Aruba and Bonaire, and I honestly didn’t meet a single person who didn’t also speak English. The U.S. dollar is widely accepted, and cars are driven on the right side of the road, all of which makes acclimating very easy for anyone coming from the States. While you’ll find plenty of opportunity to sample a variety of island fare, you won’t have to worry about finding something more familiar for your pre-race meal. My husband and I dined at Serafina, a Puglia-style Italian restaurant that prides itself on creating authentic dishes based on the owners’ old family recipes, like truffle pasta. The atmosphere is well-suited for a group of runner friends, either for carb-loading purposes or for celebrating with a few bottles of nice wine. You can literally stay right at the start. The party picks up after the race ends. I was fortunate enough to stay at the Hilton Curaçao, which is the location for the race start, finish and post-race party. The biggest complaint I have is that this experience is going to make it pretty tough for me to deal with having to drive to and from my next race. Waking up and walking straight down to the start (not to mention having my own bathroom!) was just killer—and popping upstairs right after crossing the finish line to rinse off and change before joining the post-race party? Even better. The Running Girlz were also big fans of these kinds of accommodations. “It’s a great option for a larger group and ends up being cheaper so more ‘girlz’ can join us,” Ziemer said. “[There’s also less organizing [to do] once we get to our destination; no worries about reservations and cabs every night. And no bills to split up!” Their group opted for the Sunscape Resort, which is located at the half-marathon turnaround, and they raved about the snorkeling opportunities available right off the beach nearby. Beach hopping is easy (and worth the effort). Photo provided by Dushi SUP. Swimming out from the beach at the hotel was an absolute delight—no picture can possibly do justice to the stunningly clear turquoise water. I took a grand tour of the island, which included renting a car to explore the gorgeous beaches of Westpunt less than an hour’s drive away. You could begin, as I did, with a stand up paddleboard (SUP) yoga lesson with Liberty Suares of Dushi SUP at Playa Jeremi. I can’t promise you’ll see a rainbow like I did; Curaçao is actually quite dry, so the short rain shower that started during my session was a bit of an anomaly. But I can promise that you’ll feel more connected to the water—and maybe also to yourself—once your hour with Suares is over. Be sure to plan a stop at Shete Boka National Park, and if you don’t have time to take it all in, at least spend a few minutes at Boka Pistol to watch the majestic waves crash and burst high into the air. There’s a trail here for those looking to log a few bonus miles, but even if you’re just walking to the viewing platform, sneakers are a better idea than flip flops, as the terrain is uneven. 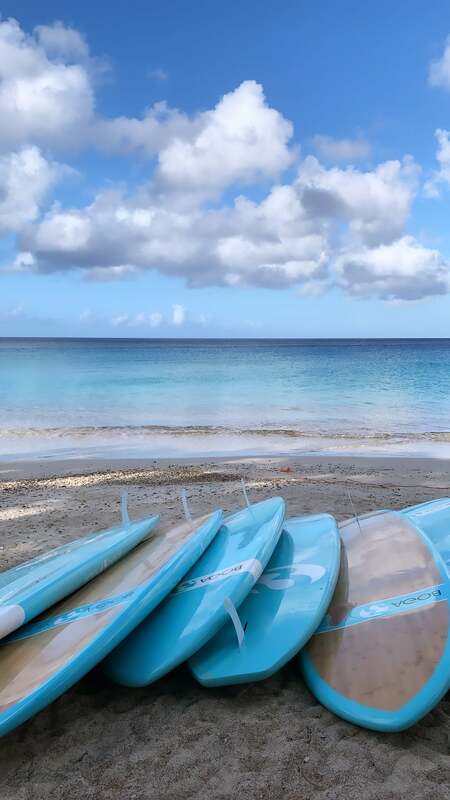 You’ll also want to visit a few of Westpunt’s other beaches, like Playa Knip, which is consistently rated one of the top beaches in the Caribbean. Make sure to bring your snorkeling gear when you head to Playa Piskado so that you can swim with the sea turtles (for free!). The local fishermen clean their fish there, tossing the heads into the water, which draws the turtles. You’ll swim right out from the beach, and while you cannot touch them, these turtles aren’t shy, and they’ll come close enough for you to get a good look. If you’re lucky, you might even recognize one or two from the mural painted on the building in the parking lot that tells you all their names. Closer to Willemstad there’s Playa Porto Mari, a great beach for grabbing a drink or a bite to eat, floating around a bit and snapping a photo of Willy and Woody, the beach’s two resident wild pigs. They tend to enjoy their siesta between noon and 4 p.m. though, so time your visit accordingly. If you see them coming, be warned: they are not shy about nosing around in your bag in search of snacks. Your food often comes with a view. If you are beach-hopping, you’ll likely want to grab a bite at one of the nearby restaurants that overlooks the turtles and Playa Forti. I noshed on shrimp and rice (although I could’ve opted for iguana) at Blue View Restaurant, which also provided views of the cliff jumpers taking off from Restaurant Forti. That said, there’s another amazing restaurant experience you’re definitely going to want to make time for, this time over on the other side of Willemstad at Jan Thiel Beach. Bring a swimsuit, your friends and an appetite, because after relaxing near the beach, perhaps watching (or playing!) a little sand tennis, you simply must dine at Zest Beach Café. Start with the flatbread and thank me later. Downtown is basically an art gallery—and not just because of the brightly-colored buildings. 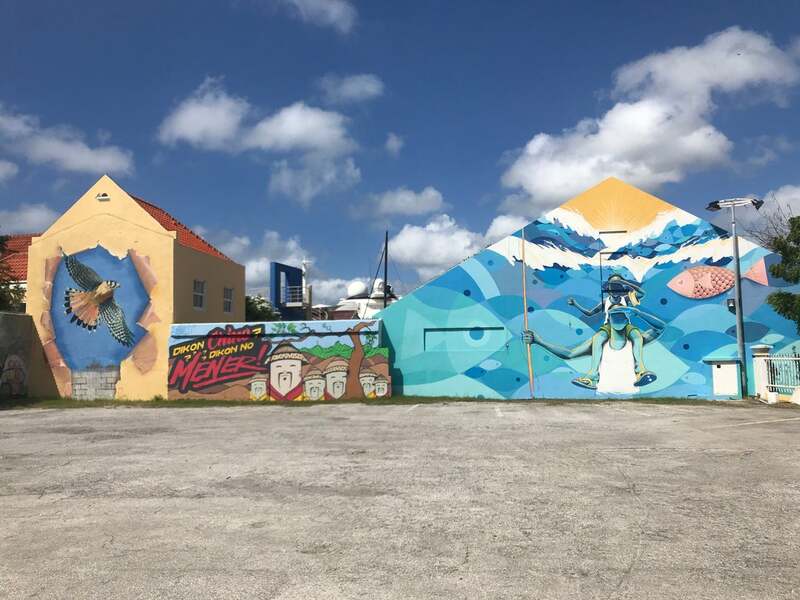 While you’ll get a bit of a look at downtown Willemstad during the race, it’s worth your while to set aside a couple of hours to walk around at a more leisurely pace. Not only will you be able to shop at the floating markets, which sell fruits, veggies, crafts and more, but if you keep your eyes open, you’ll find striking murals around almost every corner. If you’re not content with the mileage you covered on race day, you can easily hop back on the running trail along the waterfront leaving downtown and get your own 10K in on another day. Let’s face it: Even a laid-back vacation doesn’t mean we want to take too much time off from the activity we all love, right?